When you only have less than 20 minutes to make dinner what do you do? Rice and pork chops! Rice and pork chops is a popular dinner dish in Puerto Rico. They key to a 20 minute meal is to always try to make something ahead. In this case I had left-over rub that I saved and re-used it to season my pork chops. In a sauté pan, heat 2 tbsp oil and sauté onions until they turn translucent. Add a can of diced tomatoes, garlic, grated carrot, spinach, oregano, and tomato paste and cook on a medium flame for 4-5 minutes, stirring frequently. Add rice, turmeric, chili powder, salt and pepper, and sauté for a few more minutes until everything is blended. Add the chicken broth and reduce the heat, cover, and cook for 20-30 minutes, or until the liquid is absorbed. The glaze on those chops looks delicious. Great, fast dinner! It's always nice to get in and out of the kitchen during the summer. 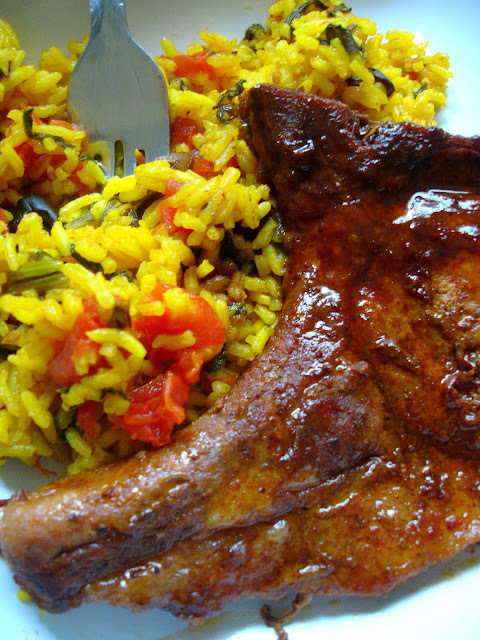 Dominicans love pork chops and rice too and your take here looks awesome! I would have never thought to add Turmeric to color the rice. I bet it added some amazing flavor to it.